Clipper City representative Thomas Cizauskas was in Fredericksburg today to host a beer tasting at Total Wine. Tom poured samples of a number of Clipper City beers and offered plenty of information about the beers to a steady crowd. Clipper City BaltoMärzHon led the lineup. Next up were beers from the Heavy Seas line; Small Craft Warning Über pils, Red Sky at Night - Saison Ale, Loose Cannon Hop3 Ale, and Peg Leg Stout. Tom also had the brewery's Summer seasonal, Hang Ten Weizen Dopplebock with him. Hang Ten hasn't shown up in Virginia yet but look for it soon. Tom had both of the new Oxford Organic Ales available for sampling as well. Oxford Class Organic Amber Ale and Oxford Organic Raspberry Wheat Beer are not yet available in Frederickburg. However I understand the distributor has them and we'll be seeing them both soon. I was quite surprised by the Raspberry Wheat. It's not what I had expected from a fruit beer. The flavor is very crisp and refreshing. I might not have picked it as out as a fruit beer in a blind tasting. Of course it's hard to describe in detail without enjoying a full glass, which I'll be doing as soon as the beer makes it to local shelves. I enjoyed the chance to try out the new Clipper City beers, along with some old favorites. It was also good to see so many shoppers enjoying the beers and showing interest in craft beer. I saw quite a few people picking up six-packs to take with them after tasting the beers. A lot of local beer folks will be enjoying Clipper City beers with their holiday celebrations. I've posted a few photos from the tasting event here. 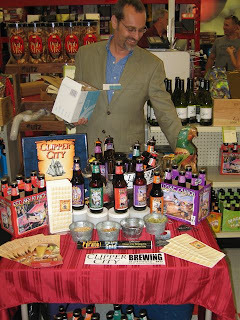 You can find out where Tom is pouring Clipper City beers by checking his blog at Yours For Good Fermentables. Seems like most stores in my area only do wine tastings and rarely any beer tastings. I'll have to branch out and visit more stores I suppose but in small town like Greeley, not many nearby choices. Looks like you had a nice time with the Clipper City ales. Dave, we're fortunate that the local retailers frequently open beer for tasting. It's rare that we get a brewery rep to do a tasting so this was a treat.